I met Kohe when I was fifteen, and we have now been best friends for 36 years. She has helped me, supported me, loved me, lead me, uplifted me, scolded me, held me and laughed with me over many years of amazing experiences. She is the dearest most treasured blessing in my life, an incomparable role model, mentor, best friend and ‘sista’. Our friendship is not about seeing each other now and again but living our lives together. Kohe has demonstrated leadership by being a worthy role model. I have been clean and sober for 22 years following Kohe’s example after seeing the inspirational changes in her life. Kohe has a strong, loving marriage, raised and homeschooled seven children. She is passionate about seeing her whānau, children and mokopuna living a life of tikanga, reo, freedom and spiritual strength. Her mantra is ‘wairua focused-whānau driven’. 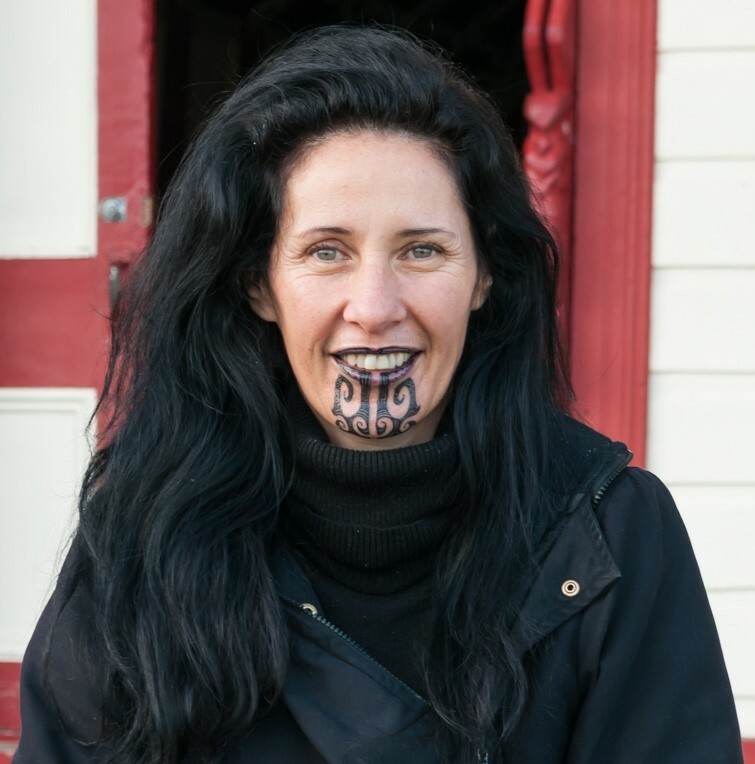 In the Māori whānau recovery wananga Kohe organised alongside her husband Rawiri she focused on women’s group meetings and children’s programmes. Her intent to meet the need of mothers to take the recovery tools the mothers had learnt back into their homes and to their children. She has Te Taketake Diploma in Addiction Counselling (Level 7) and has taken on a leadership role in Higher Ground’s Kaupapa Whānau Oranga programme. Over and over again Kohe managed to overcome misgivings, doubts and challenges by clients and staff via her inclusive, non-judgmental approach. The result even when participation in the Māori programme was non-obligatory, it was adopted virtually 100% by all residents, Māori and Non-Māori. Kohe works with clients to support treatment and healing from addiction by using Maori paradigms of restoration such as powhiri, karanga, mihimihi waiata and whakawhanaungatanga. Kohe is a registered drug and alcohol practitioner with the Addiction Practitioners’ Association Aotearoa New Zealand. One of Kohe’s other clinical achievements is her single handed development and facilitation of Higher Ground's parenting group. The weekly group has succeeded in helping residents to soften their defences and to embrace more caring and honest interactions with each other, their children and their whānau. Kohe’s 25 years of being alcohol and drug-free have supported her expertise in the 12 Steps of Recovery programme. Kohe’s practical common sense coupled with her acute intuitive capacity inspires positive change in individuals and organisations. Kohe alongside her children is learning Reo at kura pō (night school) classes Unitech Institute of Technology, and with her developing confidence, she shares her new learning with work colleagues and friends. Kohe has recently begun teaching kapahaka at Titirangi Waldorf School, supporting her children and other families to learn more about Māori culture. How do you describe someone that oozes love, that is passionate beyond all description, that grounds her feet firmly in Papatūānuku, maintaining her own integrity and that of her whānau that wears her whakapapa with pride, that is as fierce as a lion but gentle as a bluebird. Simple my beautiful friend Kohe Pene. This beautiful woman throughout my life has shown me what unconditional love is by being persistent and never conditional in the way she loves me. She has shown me what true strength looks like through overcoming trials, heartache and pain and humbly holding her head high. She has shown me what compassion, empathy and selflessness looks like by replicating it herself. She has shown me how to maintain joy even when your circumstances would not naturally reflect it.